I attempted to sign up for a new rewards style card from Capitol One. A few days prior I got my FICO score which is 800, with no balances. Capitol One denied me online, and said they'd send a mail as to why. "Based on the application information for Scott E*******, there are worsening economic conditions in your area." They also state that, "We did not request a copy of your credit file and therefore no inquiry will be placed on your credit report." 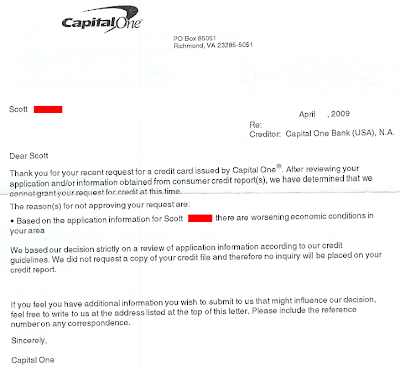 There you have it, a credit worthy borrower denied credit just because I live in Tampa. One case does not a trend make, but redlining appears to be back in vogue. We have gone from redlining to reverse redlining (seeking out the worst possible credit risks after the Bankruptcy Reform Act of 2005), back to redlining in front of new card rule changes from Congress.